Take a breather from the hustle and bustle of the city and appreciate the beauty around you. (SPOT.ph) The presence of art in a city is a reflection of its culture. 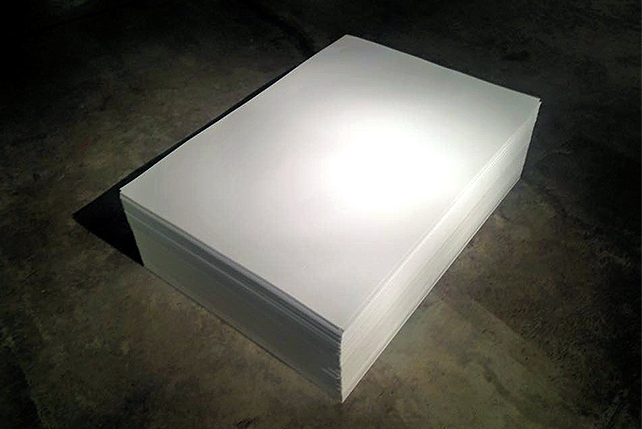 In Manila, the art scene has fruitfully evolved, making it more accessible to the public. Sure, the city is filled with museums and galleries at every corner, but everyone who lives here knows that art can be seen along EDSA, in schools, on walkways—everywhere. There are so many masterpieces around Manila, and we've rounded up 10 that you should see. Get your cameras ready! 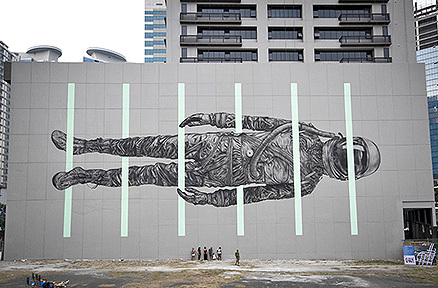 The Art BGC project transformed Bonifacio Global City into a giant gallery. 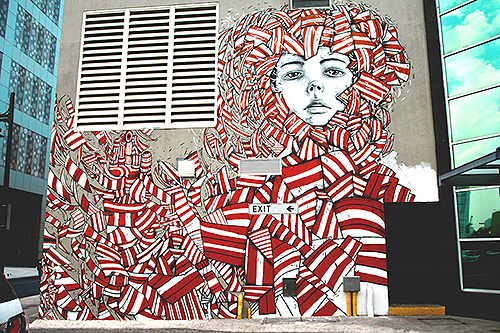 One of the standout murals is Anjo Bolarda’s black-white-and-red mural along Bonifacio High Street. Bolarda is one of the Filipinos who worked on the project, along with many international artists like Drew Merritt and Cyrcle. He employs a style which he calls “Sukiyaki-Western,” a fusion of Japanese art and Western street art. His piece shows his signature style of intricately drawn geometric patterns with a creative play on detail. The Nagtahan Bridge along Lacson Avenue flaunts art underneath—we’re talking about the columns supporting the flyover. The Metropolitan Manila Development Authority (MMDA), together with the National Commission of Culture and the Arts (NCCA), commissioned students from different universities to help spread awareness of the richness of Filipino culture and heritage through art. 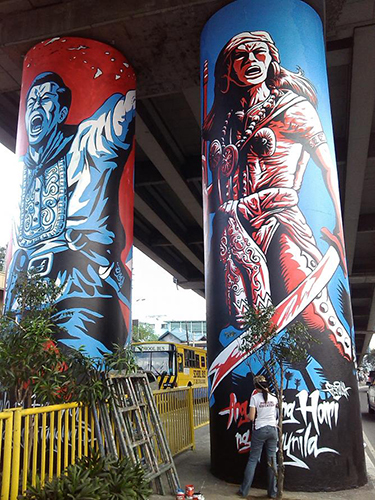 The stone columns were transformed into colorful murals of Andres Bonifacio, Magellan, and Filipino ethnic groups. 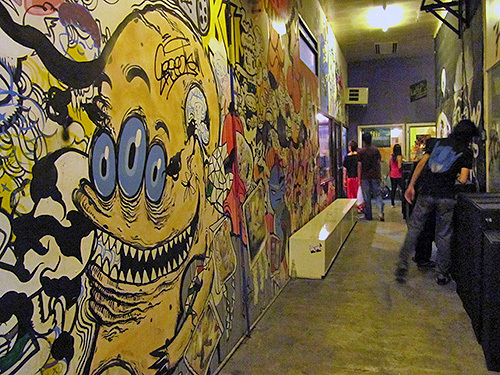 The Collective in Makati houses a community of art spaces, comfort food, and rare music. 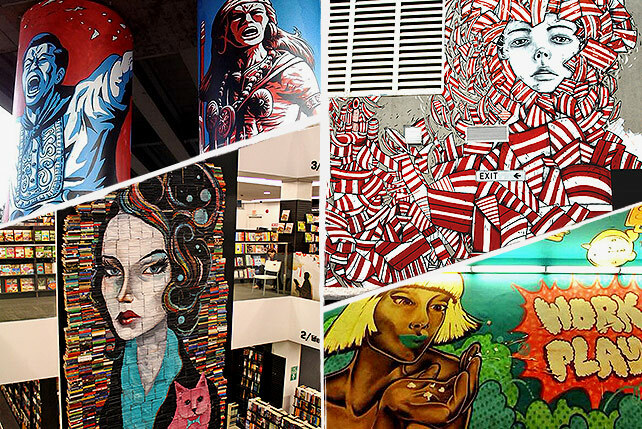 Its walls are covered with eye-popping murals that are perfect backdrops for your #OOTDs. The walls also make your dining and partying experience a lot more fun. You might even catch a live painting session or an art exhibit during your visit, which are regularly held in the area. Artists from Cavite-based group Cavity Collective (CVTY) were tasked by the Metropolitan Manila Development Authority (MMDA), the Department of the Interior and Local Government (DILG), the Pasay City government and the National Commission for Culture and the Arts (NCCA) to turn the Pasay Cemetery wall into a beautiful work of art for the Arts in Public Spaces program. The area used to be where residents threw their garbage. The residents cleaned the area, while the children and the CVTY painted the nine-foot walls, comprising 30 panels. Through creative interpretation, the murals tell the story of Pasay City as a "travel city," since major airports are located in the area. In 2013, the Armed Forces of the Philippines (AFP), together with civilian volunteers, inaugurated the world’s longest peace mural called “Lakbay Para sa Kapayapaan.” The mural stretches 3.7 kilometers from White Plains Avenue, to EDSA, to Col. Bonny Serrano Avenue in Quezon City. According to lead artist AG Saño, the walls are divided into three parts: sovereignity, beauty, and bayanihan. For him, it is a significant way to tell stories and deliver a message. “This project is about breaking barriers that prevent us from moving forward. I was convinced of this when I saw soldiers painting alongside children of rebels,” artist AG Sano said in a statement. Carlos Celdran, along with Mark Salvatus and the Pilipinas Street Project, came up with the idea of providing a venue for skaters to practice, as well as to keep drug addicts and garbage away from the area. It is now known as The “Graffiti wall” in Anda, Intramuros, and has become a canvas for graffiti artists, where they can legally express themselves mural after mural. It’s also a different experience each time, since most of the murals are fleeting and are easily painted over. What’s not to love about an ever-changing canvas? 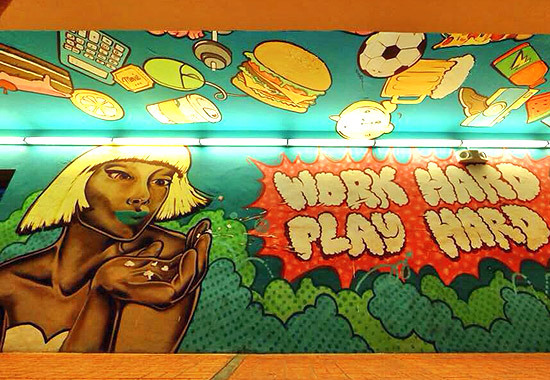 According to Geloy Concepcion, one of the independent artists commissioned to beautify the walkways and underpasses of Makati Central Business District, they were tasked to uplift the fast-paced lives of Makati employees through art. You will see his murals, together with the works of Kookoo Ramos, Rai Cruz, Nemo Aguila, and other artists, along the elevated walkway that stretches from Dela Rosa leading to Greenbelt, and also on the ceilings of the Makati Avenue underpass in Ayala. The painted pictures present a strong yet funny message about maintaining work-life-balance. The underpasses in Sedeno and Legazpi also display eye-catching murals. It's impossible to miss the 24-foot installation by LA-based artist Mike Stilkey inside the Fully Booked store in Bonifacio High Street. “Discarded Romance” was on exhibit in Times Square, Hong Kong when Fully Booked acquired the piece, then they invited Stilkey to install the sculpture in their store in Manila. The permanent store sculpture features over 3,000 books, many of which were recycled from the San Marino Public Library and stamped “discarded.” If you’re curious about what kind of books were used, most of them are romance novels. 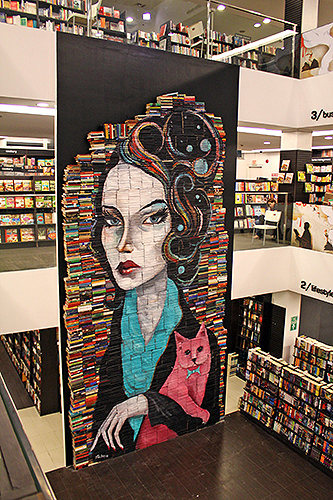 The image of a woman holding a male cat—made of ink, colored pencil, paint and lacquer—greets book lovers who enter the store. You might have seen California-based artist Cyrcle’s mural of a photorealistic astronaut floating horizontally through space on a massive white wall posted all over Instagram. “Between the Lines,” which is also part of the Art BGC project, can be found on the side of the Icon Plaza Building in Bonifacio Global City. The piece is a commentary on technology and humanity's role in it. It’s actually a part of a larger body of work Crycle has been working on around the world, with the lunar green being the consistent element tying his works together. Photos from the establishments and artists' archives; Filipino Street Plan (Nagtahan Bridge); GMANetwork.com ("Lakbay Para sa Kapayapaan"); and Primer.com.ph (The Collective).